From the vantage point of the colonized, a position from which I write … the term ‘research’ is inextricably linked to European imperialism and colonialism. The word itself, ‘research’, is probably one of the dirtiest words in the indigenous world's vocabulary … It stirs up silence, it conjures up bad memories, it raises a smile that is knowing and distrustful. Research by its very nature is inherently political; it is about the nature of power as well as access to power … The academy has been dominated by White middle-class and/or male researchers, whose political values and commitments have influenced social research, leading it to be predominantly Eurocentric, bourgeois and patriarchal in its agenda … This agenda has been informed primarily by the dominant groups, such that the ‘marginal’, the ‘powerless’ and the ‘oppressed’ have been the excessive object of study. [about] academics’ (Smith 1999: 67). Surely, we need to undo this perception of indigenous/native people, and this is why we need a book about performing qualitative cross-cultural research. This book may help cross-cultural researchers to avoid repeating our history of treating local people badly. The presence of indigenous populations in countries such as Canada, the United States, New Zealand and Australia has a great ramification for social science researchers. These indigenous people have been colonised and have become marginalised in their own native lands. More disturbingly, their traditional knowledge and ways of living have been stolen, damaged and destroyed by the colonising process (Smith 1999, 2006a, 2006b, 2008; Iwasaki et al. 2005; Walker et al. 2006; Aspin & Hutchings 2007; Bartlett et al. 2007; Salmon 2007; Bishop 2008; Denzin et al. 2008a, 2008b; Cram 2009). Inequalities in education, employment, health, living conditions and opportunities among indigenous people (in comparison to white, dominant groups) continue to exist while the ‘mainstream’ societies have become even wealthier. Indigenous people continue to disproportionately represent those who are poor, sick and disadvantaged in health, welfare and opportunity in nations such as Australia, Canada, New Zealand, the United States (see Rock 2003; Iwasaki et al. 2005; Walker et al. 2006; Bartlett et al. 2007; Bishop 2008; Smith 2008; Cram 2009). Rates of imprisonment, suicide and alcoholism are disproportionately high among indigenous populations around the globe (Smith 1999). Deaths in custody of indigenous Australian men are well known and continue to the present time. This has led some social science researchers to suggest that indigenous groups live in the fourth world (O'Neil 1986; Bartlett et al. 2007). It has been suggested that dealing with these problems among indigenous people should be seen as ‘a top priority’, not only in policy making and service provision, but also in research (Bartlett et al. 2007: 2372). not only neglected to involve Mãoris in the development of their research (Walsh-Tapiata 2003: 55), but also have marginalised them as people who have problems and who cannot cope or deal with their problems (Bishop 2008; Smith 2008; Cram 2009). Pakeha researchers gain great benefit from their research, but not for Mãoris. This has happened similarly to indigenous people in other parts of the world, too. From the indigenous perspectives, Linda Tuhiwai Smith (2008: 116) contends, research is ‘so deeply embedded in colonization that it has been regarded as a tool only of colonization and not as a potential tool for self-determination and development’. It has now been realised that research in a number of areas, including social welfare and health needs, is crucial (Walsh-Tapiata 2003; Bishop 2008; Smith 2008; Cram 2009). But this research must employ culturally sensitive and empathetic approaches which take into consideration the issues and problems which are important for the people who are being ‘researched’ (Smith 1999; Cram 2009). There are also those ethno-specific groups who have lived for long periods in some Western societies, such as African Americans in the United States and Caribbean-born people in the UK. These people have also been marginalised by social, cultural and political factors. Many of them have been caught in research endeavours carried out by researchers who exploited and abused them or who had little or no regard for the cultural integrity of these people. This has tremendous implications for cross-cultural research at the present time. Multicultural societies such as the UK, the USA, Canada, New Zealand and Australia contain an increasing number of people from different cultural, ethnic and linguistic backgrounds. These people may arrive as immigrants (legal and illegal) or as refugees who have fled war-torn countries. Many of them have health problems and no access to social benefits. Their health and well-being have implications for the provision of culturally sensitive health and social care in the host societies. Hence, the provision of culturally sensitive care has become ‘a necessity’ (Dunckley et al. 2003; Tsai et al. 2004: 3; Barata et al. 2006). Globally, too, we have witnessed many poor people become vulnerable to health and social issues. These people have also been subject to abuse and exploitation in intervention and experimental research (see Macklin 2004). Because of their poverty and powerlessness, many have been coerced into research endeavours which render them more vulnerable. At the present time, we are still witnessing this. Do we, as social science researchers, have a moral obligation to provide culturally competent care to these marginalised people? obtained by research, and particularly by the qualitative approach (Esposito 2001; Papadopoulos & Lees 2002; Hall & Kulig 2004; Tillman 2006; Smith 2008; Liamputtong 2008, 2009). Many researchers have started to conduct projects with vulnerable and marginalised people in a cross-cultural context. But it is crucial that the researchers ensure that their research is conducted ethically and that they take into account the cultural integrity of the participants. As a result, their research may not harm but benefit local people who take part in it (Smith 1999; Borkan et al. 2000; Liamputtong 2008; Smith 2008; Chilisa 2009; Cram 2009). 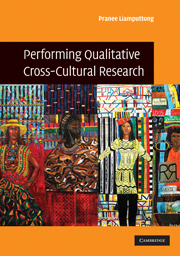 Despite the increased demands on cross-cultural research, as Esther Madriz (1998: 7) contends, discussions on ‘culturally sensitive methodologies’ are still largely neglected in the literature on research methods, including qualitative methods. As a result, people who are working within socially responsible research in cross-cultural settings often confront many challenges with very little information on how to deal with these difficulties. Conducting cross-cultural research is rife with ethical and methodological challenges (Small et al. 1999a, 1999b; McDonald 2000; Best 2001; Hall & Kulig 2004; Mkabela 2005; Bishop 2008; Hennink 2008; Liamputtong 2008). This book is born out of this need. In this first chapter, I shall introduce the case with which I wish to start the discussion about the necessity of performing qualitative cross-cultural research. Then, I shall proceed to stage the essence of qualitative research in cross-cultural research. As in any good methodology textbook, I shall then provide some theoretical standpoints that I believe sit neatly within the framework of cross-cultural research. Before proceeding further, I must make it explicit that individuals or groups that I will refer to in this book include those who are indigenous populations, ethnic minority groups in Western societies and those living in non-Western societies who are also poor and vulnerable socially, culturally, politically and economically. Hence, my discussions may at times refer to indigenous people, immigrants, refugees, ethnic minorities, Aboriginals and cultural groups interchangeably. ethnic minority populations in cross-cultural research (see also Liamputtong Rice et al. 1994; Liamputtong 2009). Mai was thrity-four years old, married and had six children. Four children were born in a refugee camp in Thailand and two in Australia. Five of her children were born naturally. However, when Mai had her last child she was advised that she needed a caesarean section since the baby was in a transverse lie. Mai refused the caesarean and insisted that she could give birth naturally. She was told that if she attempted a vaginal birth the baby might not survive. Because of her concern about the survival of her baby, Mai agreed to a caesarean. However, the caesarean was carried out under a general anaesthetic and she was alone in the operating theatre as her husband was not allowed to stay with her. Since the birth of that child, Mai had been physically unwell. She saw a number of specialists about her health, but they were not able to find anything wrong with her. Mai believed that while she was unconscious under the general anaesthetic one of her souls, which takes care of her well-being, left her body and was unable to re-enter. Because she was moved out of the operating theatre and regained consciousness in a recovery room, she believed that her soul was left in the operating theatre. She strongly believed that the departure of this soul was the main cause of her ill health because she frequently had bad dreams in the following ten months. The dreams occurred two or three times a week. Each time, after the dream, she felt very ill and had bad pains. In her dreams, she wandered to far-away places. She did not know where she was going since she had never seen these places before. It was as if she just had to keep walking and there was no ending. Mai believed that this was a sign that her lost soul wandered in another world. fall, a loud noise, being alone in darkness, feeling sad and lonely, and being unconscious. Common symptoms include tiredness and weakness, headaches and fever, loss of appetite but increased thirst, insomnia, and frequent dreams of being in a strange place with a stranger. In order to regain her health, Mai believed that she must undergo a soul calling ceremony and that this would have to be performed at the operating theatre in which the caesarean had been done, and where her soul would still be waiting to be called back. I asked her if she had approached the hospital, but her instant response was that it would not be possible since the hospital staff would not understand her customs and would refuse the request, since the ceremony involved a live chicken and the burning of an incense stick. Her husband made the comment that it was hard enough to accompany his wife into the operating theatre, so it would have been impossible to perform a ceremony which is alien to Western health care providers. Because Mai felt unable to perform a soul calling ceremony at the operating theatre, the family believed that her soul had transformed into another living thing because it had left her body for a lengthy period of time. Thus, as a consequence, her health continued to deteriorate. Concerned about the well-being of Mai, I promptly had a meeting with my superior and discussed the possibility of taking Mai back to the hospital to perform a soul calling. My superior immediately contacted one of the hospital staff. Through this person the Deputy Chief Executive Officer of the hospital agreed to the request. Her positive response was that ‘the hospital is more than happy to do anything for the woman if this can help her’. She then left the name of a person to contact for making the arrangements. the shaman also performed the same ritual at the spot where Mai regained consciousness in the recovery room. This took him only ten minutes. Then we all went back to Mai's house to perform another ceremony. This was to welcome the soul back to its home. Could this situation have been avoided? I believe it could if the cultural beliefs and practices of the Hmong women had been taken into account. No doubt, in this particular case, a caesarean section was essential for the survival of the infant. However, it could have been managed differently. For example, an epidural anaesthetic could have been used, and Mai's husband should have been with her in the operating theatre so he would be able to call her soul into the recovery room for her. The positive aspect of this ceremony was the agreement of the hospital to allow Mai and her family to perform a soul calling ceremony in the operating theatre, in addition to the concerns about her well-being by hospital staff. This illustrates how mainstream health services can provide culturally sensitive care to consumers from different cultural backgrounds, if they are informed of these cultural beliefs and practices. Within multicultural societies such as Canada, New Zealand, the UK, the United States and Australia, different cultural sensibilities need to be understood not only as a matter of cultural tolerance, but because they may have a direct effect upon the health and well-being of a mother and her newborn, as well as on the use of health services. A knowledge of existing patterns of childbirth beliefs and practices amongst Hmong women should be a prime concern in establishing maternal health programmes in Australia. This knowledge can improve our understanding of women's acceptance or rejection of certain practices and health resources. When misunderstanding and mismanagement are eliminated, there will be better health care delivery for consumers from different cultural backgrounds. This is particularly important among the Hmong, since the majority of Hmong women are of childbearing age. Because the Hmong put a high value on having many children, they will be major users of mainstream health services, and health care providers will have more contacts with Hmong women. But how we do acquire this culturally appropriate knowledge from individuals who come from different cultural backgrounds? It is only through qualitative enquiry which allows the researchers to work closely with the participants, and which allows them to build trust and rapport with them; the participants have their opportunities to articulate their needs and concerns in great depth. This is what I advocate in this book, and I shall come back to this point in the latter part of it. It is important to avoid causing suspicion and fear, and thereby maintain the trust of … broader communities, for it is from a position of trust that we are able to continue the work that we – and hopefully others – value. History is filled with the abuse and exploitation of ethnic, non-Western and indigenous people which was calculatedly carried out by Western researchers in experimental or intervention research. It is not surprising that this has resulted in suspicion and fears among these groups (see also Chapter 2). A social pathology research approach has developed in Aotearoa/New Zealand that has become implied in all phases of the research process: the ‘inability’ of Mãori culture to cope with human problems and propositions that Mãori culture was and is inferior to that of the colonizers in human terms. Similarly, studies which examined perceptions of medical research among ethnic minorities have shown that these people generally ‘have more negative feelings towards research than their White counterparts’ (Robinson & Trochim 2007: 523; see also Mouton et al. 1997; Kressin et al. 2000; Shavers et al. 2002). Participation rates in prevention trials in particular have been significantly lower among ethnic minority populations (see Giuliano et al. 2000). do not believe the research goals will benefit their communities, are fearful that the research will further stigmatize their children, or are concerned that confidentiality breaches will lead to unnecessary government intrusion’ (Fisher & Ragsdale 2006: 6; see also Fisher & Wallace 2000; Fisher 2004). A recent survey undertaken by Corbie-Smith et al. (2002) with 1,000 African-American and white adults showed that African Americans were more likely to say that individuals from their ethnic groups would be used as ‘a guinea pig’ without their consent. They were also likely to state that doctors often gave out medications for conducting experiments on people without their consent, or provided treatment as part of their experiment without getting their permission. Sengupta et al. (2000) carried out a survey of thirty African-American adults in order to examine factors which might affect their participation in AIDS research. More than half of them said that black people are very suspicious of research that is undertaken in their communities. They also believed that the African-American community had not benefited from any AIDS research with which the US government had been involved. Vicki Freimuth and colleagues (2001) also found that the lack of trust in the informed consent procedures and the researchers among African Americans was a great barrier to recruitment in their research. Similar suspicion and fear have also been reported in studies concerning HIV and mental health among black women (see Tharao & Massaquoi 2002; Onwumere et al. 2002; Mills et al. 2006; Suite et al. 2007; Williams et al. 2009). This is not surprising when one listens to folklore within the African-American communities: ‘The legend was that unsuspecting Black people would be kidnapped, usually at night, and taken to hospitals to be killed and used in experiments’ (Wallace 2006: 68). This suspicion and distrust is born out of the ethical horror story of the Tuskegee syphilis experiment (see Chapter 2). As Tovia Freedman (1998: 945) succinctly puts it: ‘As long as the Tuskegee Experiment is imprinted in the concerns of Black persons, no matter what their educational background and training, the fear of “becoming guinea pigs for White people” will be difficult to dispel’ (see also the recent discussion provided by Susan Reverby (2008)). is of a different ethnicity [from] the participants’ (see also Chapters 5 and 6 in this volume). But this does not mean that indigenous and ethnic minority people do not wish to participate in research. Wendy Wendler et al. (2006) have shown that although ethnic minority people have lower participation rates, they are as willing as their white counterparts to participate in research. Sengupta et al. (2000) also show that they wish to help their community by taking part in research. And Freimuth et al. (2001) have also suggested in their study that African Americans see the value of some types of research. Because of a negative perception of the research process, which is based on the history and personal experiences of indigenous, ethnic minority and cultural groups, researchers need to reconsider their research design to make it more culturally appropriate for these groups (G. Smith 1992; Rigney 1999; L. Smith 1999, 2008; Lomawaima 2000; Robinson & Trochim 2007; Tillman 2006; Bartlett et al. 2007; Bishop 2008; Dillard 2008; Liamputtong 2008). This is particularly so for the design and implementation of a research project, including recruitment, methodology, the process and the outcomes of the research. If the researchers pay more attention to the social and cultural needs of these people, and employ culturally appropriate research methodology in a manner that reduces or eliminates their suspicions and fears about the research, then they may be more willing to participate in the research (see Smith 1999; Tillman 2006; Bishop 2008; Dillard 2008; see also later sections on theoretical frameworks). Most qualitative approaches, which are based on the methodology of healing, love, compassion and the decolonisation of hegemony of positivist science, permit this.